When picking up a new poetry collection, I give it an initial read and then sit with it a while, thinking about whether any particular poems or lines stuck in my mind, or whether I had any specific feelings while reading. Sometimes I draw a big blank, which usually means that particular collection doesn't merit another read. Collections like Crow Mercies are different. Even during my first reading of this collection, I found myself stopping to reread poems again out of excitement. This is certainly the kind of book that ends up a permanent fixture on my bookshelf that I come back to again and again. 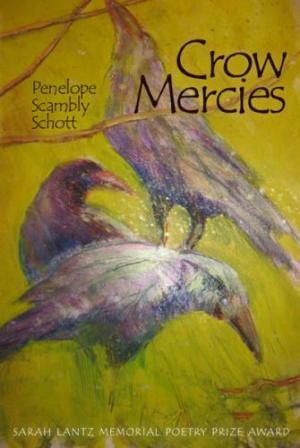 Penelope Scambly Schott is a former English literature professor living in Portland, Oregon, and Crow Mercies, her fifth poetry collection, won the Sarah Lantz Memorial Poetry Book Prize. Schott has also published three poetry narratives and five chapbooks. She identifies as a feminist poet, and this collection aims to create a forum for women writers who might not otherwise be heard. Schott's poems seem to inhabit the realms of female roles and experiences: wife, mother, daughter. In my favorite poem in this collection, "The US Air Force Admits it May Have Bombed Civilians in Afghanistan," Schott uses the connection between mothers and their children to explore the contrast between people living in daily fear of being killed in Afghanistan and those in the United States who are relatively safe and secure. Never hitting you over the head with the points it makes, the poem left me choked up. The poems in Crow Mercies often speak about relationships, running the gamut from grandparents to children to siblings. Family relationships and complexities are something most everyone can relate to, so I felt it brought a real accessibility to her work. I am generally not moved by poets who write of the aesthetic of nature with no deeper meaning. Yet, Schott utilizes strong natural imagery and metaphor very heavily throughout the collection. She does so beautifully; her images, rich with meaning, carry the words along. Bears, orchids, roses, reeds, the wind, and the ocean all become crucial to the poems, evoking strong emotion. One skill Schott has mastered is the zinger, the end line that packs a punch and leaves you thinking about a poem long after you've finished reading it. This is exactly how I would describe all of Crow Mercies. I was impressed and thrilled to find such a treasured zinger of a poetry collection.